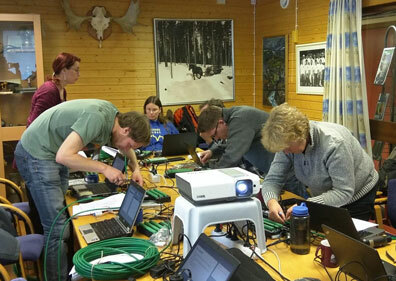 Between the 5th and 8th of April 2016, Svartberget hosted two training events in building and programming loggers from Campbell scientific. 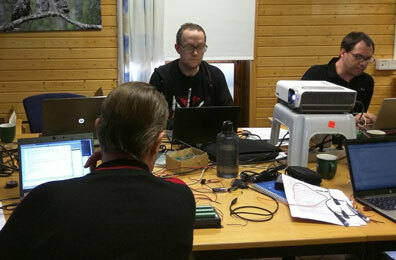 Course leaders were: Peder Blomkvist from the unit for field based forest research at SLU in Umeå, and Per Weslien from the Department of Earth Sciences at University of Gothenburg. 14 people from a number of field stations participated in the course. The course aimed to extend the knowledge for technical staff within SITES and hence extend and facilitate collaboration regarding large scale, continuous automated measurements of environmental variables. These types of loggers can be used for continuous storage of information of almost any environmental variable within any time-frame as long there are instruments that can do the measurements. During this event, temperature sensors and sensors for water depth and pressure were tested and used as practical examples. Precipitation, wind speed and wind direction were also used as examples of possible measurable variables. As the loggers are adjustable by programming and sensors are available from several different manufactures, it is possible to log almost any kind of environmental data. The course was informative and relevant, several stations are interested to use or extend their use of loggers for their own experiments. Especially interesting was the functionality to remotely download or view the loggers in real time.